Our shagadelic party this weekend was at the beautiful Conrad Hotel. It was an Austin Powers theme in honor of the Bar Mitzvah boy, Austin. This event was planned by Annie O’s and decorated by Setting the Mood. The centerpieces were brightly colored gerbera daisy’s stacked in a clear vase with a tie dye peace sign on top. Cocktail tables were decorated with groovy flower base and lava lamps. The grand entrance was a record curtain with the iconic Austin Powers logo with the Bar Mitzvah boy’s name. We created a custom sign in book with a photo of Austin in the blue velvet suit on the cover. 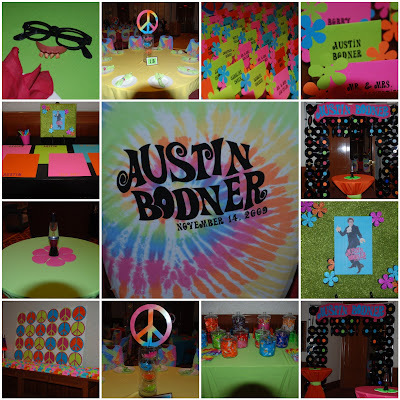 Each tween received “Austin” glasses and teeth as well as a tie dye t-shirt to take home. This entry was posted in 60's Party, Austin Powers, Groovy Party, Man of Mystery, Peace Party on November 16, 2009 by Setting the Mood.